Prayer Through The Holy Spirit. Come, Holy Spirit, fill my heart with Your holy gifts. Let my weakness be penetrated with Your strength this very day that I may fulfill all the duties of my state conscientiously, that I may do what is right and just. Let my charity be such as to offend no one, and hurt no one’s feelings; so generous as to pardon sincerely any wrong done to me. Assist me, O Holy Spirit, in all my trials of life, enlighten me in my ignorance, help me in my doubts, strengthen me in my weakness, help me in all my needs, protect me in temptations and console me in afflictions. Graciously hear me Holy Spirit, and pour Your light into my heart, my soul, and my mind. Peace, Power and Strength Through Jesus: 2 Timothy 1:6-7. 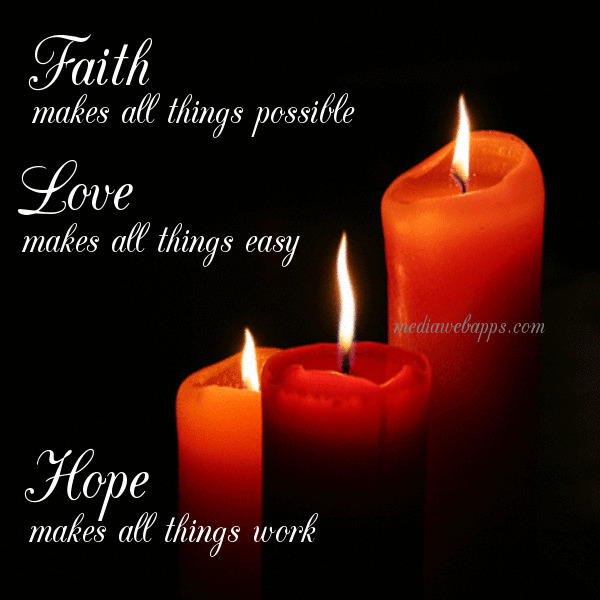 Faith, Hope, Peace and Love: 1 Corinthians 13:13. Holy Spirit, open my eyes and calm my mind. Give me the recollection of the Father’s love, of the Son’s unceasing prayer, of the world as God’s world and of your own presence within me. Holy Spirit, give me Faith. Holy Spirit, reveal to me the truth of the Father’s unfailing purposes, of the Son’s victory and risen presence; the truth about myself – sinner yet child beloved of God. Holy Spirit, give me Hope. Holy Spirit, give me Peace; peace with God and peace with people. Kindle my desire for you. Strengthen my will to live and serve. Teach me and lead me where you will. Holy Spirit, Give me love.